Anyway, I jumped on a Boris and cycled the length of Westbourne Grove in the late afternoon sunshine having saved the ridiculous Odeon online 75p booking fee. At the end of this lovely and novelty blue-skied summer Sunday I felt confident that there would be a seat and sure enough there was. I’m not really a superhero fan, but I like everything Christopher Nolan has directed so had been looking forward to The Dark Knight Rises. The Odeon Lounge at Whiteley’s is probably the best cinema in London these days. It might not have have the history or’ cool’ factor of The Electric (currently closed after a fire) or the artiness of The Screen on the Hill, but it makes up for those things with comfort and superb sound and vision quality. And the food and drink is just fabulous. An on site kitchen supervised by Rowley Leigh serves up some really lovely grub. For a few months the salsify fritters made the annoying and lantern chinned Keira Knightly bearable in a couple of features. And the venison chili was a enough to distract me from a semi naked Colin Farrell. Today, Hans Zimmer’s throbbing score I’m sure helped enliven some already rather perky squid and sweet chill sauce. For what it’s worth, the Dickensian, Hugoesque, “Passion of the Christ” themes of The Dark Knight Rises were powerful enough to keep me engrossed for all two and three quarter hours, sustained only by the squid, a coffee and suitably dark and molten chocolate fondant. And the classy customers meant the popcorn throwing, chatting and cellphone checking were kept to a minimum. I think I mentioned in my very first blog posting that I found certain parallels between going to the movies and eating alone. Both have their compensations. Not having to worry about what anyone else thinks and the ability to engross oneself fully in the experience bring an extra dimension to what is essentially, deeply personal anyway. And so The Odeon Lounge mixes two of my favourite pastimes into one place with excellent results. I only hope it stays open. Today was one of the few occasions I’ve been when the cinema has been more than a quarter full. Back home the Ocado man was rocking up with a few supplies. Isn’t the night after the big shop fun? So many options. Even though I am rarely organised enough to order in a way that guarantees certain ingredients will all work together, with the help of my store cupboard, I am usually in pretty good shape for a few days at least. Salmon and asparagus were the two ingredients that were calling to me as I disposed of the surplus of cardboard and plastic that accompanies the modern supermarket shop. So here’s a really simple supper I made with the aid of my Sous Vide Supreme but can be made just as easily without in minutes. And I apologise about the garlic scapes but I’m really obsessed with them. 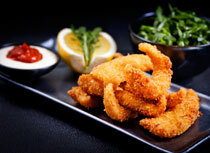 The lend such a wonderful flavour to these kinds of dishes. They come from The Garlic Farm on the Isle of Wight. Do search them out if you can. Mix the marinade ingredients and run the salmon through them. Leave for as long as you can (up to 12 hours) but if you’ve only got a few minutes, so be it. I only left it for 5 mins and it was scrumptious. Vacuum the salmon and drop into the water bath and leave for 20 minutes. To make the dressing, combine all the ingredients and taste. If you want it sharper add more lime or vinegar, sweeter add a little maple syrup. 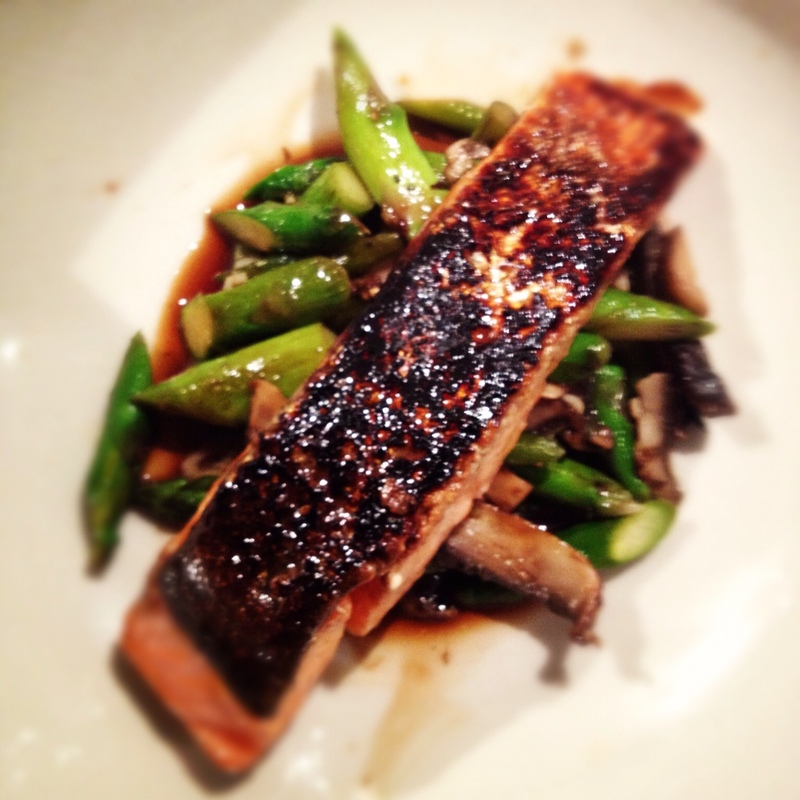 Just be careful with the soya and sesame both of which can overpower the salmon and veg. Meanwhile slice the asparagus and scapes (if using) on the diagonal into similar lengths. About 5 minutes before the salmon is ready, heat a teaspoon of peanut oil until it’s smoking and add the asparagus and scapes. After stir frying for 2-3 minutes, add the mushrooms and a little salt. As the mushrooms soften, add the garlic and then the sherry or chinese wine with a little water. Cook until the veggies are soft. Serve, and eat whilst wondering what super-power the dishy bloke from Ocado might possess. Lovely job on the skin! Thanks! Lot of heat and a dry pan.